When a great white bear promises untold riches to her family, the Lass, as she's known, agrees to go away with him. But the bear is not what he seems, nor is his castle. To unravel the mystery, the Lass sets out on a windswept journey beyond the edge of the world. Based on the Nordic legend East of the Sun, West of the Moon, with romantic echoes of Beauty and the Beast, this reimagined story will leave fans of fantasy and fairytale enchanted. She was born into a family with eight other children, one of four girls who are considered worthless by their mother, so when the ninth child was born she was refused a name to call her own. They refer to her as Pika, translating to Girl in the language of the North, but a special bond with her eldest and kindest brother Hans Peter who has just returned from a sea voyage , has her being called Lass. But Hans Peter isn't the same young man who left the family in search of his own adventure, he now spends his day carving strange figures into the firewood and teaching Lass the language of the Englanders. The winter is cold and unforgiving and shows no sign of any reprieve. The family may not last another winter, so when word filters through that the legend of the White Reindeer has been seen, even Lass is on the hunt. Those who have caught the White Reindeer are said to receive one wish, but when Lass stumbles upon the magnificent animal, she asks for something that even her family could never give her. A name. On the word of Hans Peter, Lass keeps the granted wish close to her heart, never speaking of her name, but it seems that isn't the only gift the young lass is about to receive. Rollo is a young wolf pup, and can speak. But it seems Lass is the only one who can understand him. But Rollo isn't the only one. A bear has been seen within the forest, a massive beast that is said to be whiter than snow. Hans Peter can do nothing more than warn those hunting the Isbørn, an enchanted bear not likely found so far south. The Isbørn has come to collect Lass, he needs her. In exchange for riches for her common family, the Lass is asked to live with the Isbørn for one year in his palace made of ice. The Lass has nothing to lose, and with no sign of the snow melting, she refuses to be another worthless mouth to feed. She reluctantly agrees to the Isbørn's terms and armed with nothing but a few meager possessions and Hans Peter's pelt coat, she and Rollo are dragged willingly into a life of enchantment, trolls and an evil princess that will stop at nothing to find her prince. 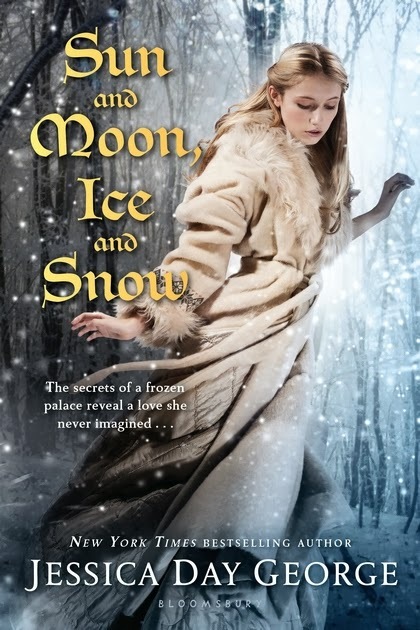 Sun and Moon, Ice and Snow was an interesting read and not having delved into many folk or fairytales, I wasn't sure what to expect. I was pleasantly surprised. It was wonderfully told, the world building was beautiful, from the small cabin where Lass lives, to the stark ice castle that she now calls home and everything in between. Considering Lass was born into borderline impoverished conditions, her sense of wonder and adventure were enchanting and I found myself invested in her story and the world around her. At times I found myself wondering where on earth this fable retelling would take me, but it was impossible to put down. It was ridiculously entertaining. My only complaint is the cover, it's not among the worst I've seen, but when most of us are guilty of cover lust, it really doesn't represent how enchanting the story actually is. I would love to see something whimsy, dreamlike and artistic. A cover worthy of a magical fairytale.